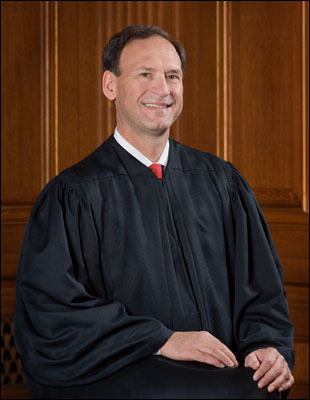 U.S. Supreme Court Associate Justice Samuel Anthony Alito, Jr.
U.S. Supreme Court Associate Justice Samuel Anthony Alito, Jr., will visit Notre Dame Law School on Nov. 19. One highlight of his visit will be a conversation with Notre Dame law students on Thursday, Nov. 19, from 4 p.m. to 5 p.m. in the Patrick F. McCartan Courtroom, followed by a reception in Eck Commons. Alito was nominated to the Supreme Court by President George W. Bush on Oct. 31, 2005, to replace retiring Supreme Court Justice Sandra Day O’Connor. He was confirmed by the Senate in January 2006 and became the 110th justice on the court. In 1990 George H. W. Bush chose Alito to serve as a judge on the U.S. Court of Appeals for the Third Circuit where he served for 16 years. From 1987 to 1990 Alito was the United States Attorney for the District of New Jersey. He was Deputy Assistant Attorney General in the Office of Legal Counsel from 1985 to 1987, and served as an assistant to the solicitor general in the Justice Department from 1981 to 1985. A native of New Jersey, Alito is a graduate of Princeton University and earned his juris doctor degree in 1975 from Yale Law School, where he served as an editor for the Yale Law Journal. The Law School will hold a lottery for students to be seated in the McCartan Courtroom. An additional room will stream the event to enable other students to view the event. Alito, whose senior thesis at Princeton was on the Italian Constitutional Court, will also be a panelist on the Book Launch and Discussion of the newly published book, Italian Constitutional Justice in Global Context, coauthored by Kellogg Institute for International Studies Director and Professor of Law Paolo Carozza, Vittoria Barsotti, Marta Cartabia, and Andrea Simoncini. Other panelists will include O’Toole Professor of Constitutional Law Anthony J. Bellia and Simoncini. The discussion will be at 4 p.m., Wednesday, Nov. 18, at the Hesburgh Center Auditorium. A reception and book signing will follow. The discussion is co-sponsored by the Kellogg Institute for International Studies, the Potenziani Program in Constitutional Studies, the Keough School of Global Affairs, and the Law School. Alito will be the second Supreme Court Justice to visit Notre Dame Law School this year. U.S. Supreme Court Associate Justice Sonia Sotomayor visited on September 2. Originally published by Denise Wager at law.nd.edu on October 27, 2015.